Obstructive sleep apnea is a disorder in which one repeatedly stops breathing during the night. It has many potential causes, all of which lead the upper airway to collapse while someone is asleep. Treatment of sleep apnea is necessary to prevent major health problems. What sleep apnea treatment is best for you? Consider ways to address the cause as well as additional options, such as continuous positive airway pressure (CPAP) therapy, oral appliances from a dentist, surgery, weight loss, and more. In order to prevent the obstruction of the airway, which is the most common cause of sleep apnea, it may be helpful to identify the contributing factors. Sleep apnea may occur due to your airway anatomy. It may be worsened by nasal congestion due to allergies or a cold. It is often exacerbated by weight gain. In women, menopause can make sleep apnea more likely. Position contributes when sleeping on your back. Alcohol and medications that act as muscle relaxants may provoke sleep-disordered breathing. In some cases, sleep apnea may improve by addressing the cause. In some people, weight loss may be enough to resolve both snoring and sleep apnea. Unfortunately, not all causes are reversible. It may be necessary to explore other treatments when sleep apnea persists. To keep the upper airway open, it is often necessary to support it with a constant flow of air delivered through a face mask worn while sleeping. This most common and effective treatment is called continuous positive airway pressure, or CPAP. There is also a similar option called bilevel positive airway pressure, or BiPAP, in which the pressures alternative between a higher and level lower while breathing in and out. Once it has been determined by a physician that PAP therapy is the best treatment option for your condition, it is necessary to visit with a provider of durable medical equipment. 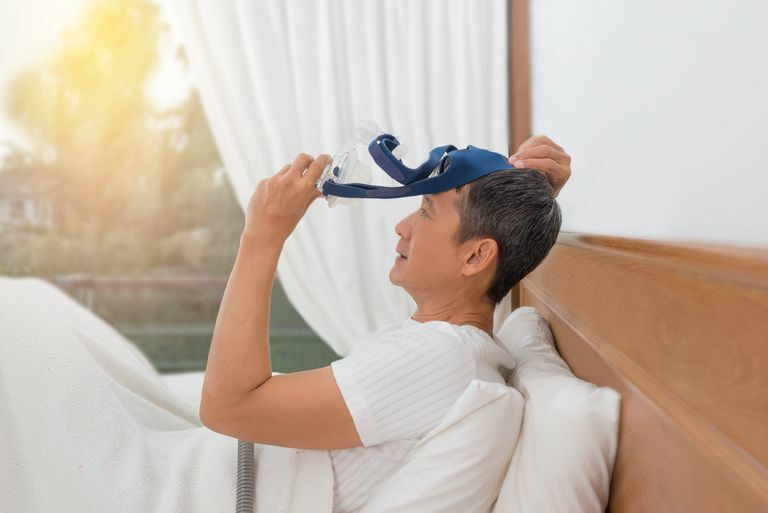 The CPAP or bilevel machine will be set to a prescribed pressure and other equipment – including a humidifier, tubing, and a personally fitted mask – will be issued. It is important to find a mask that is comfortable, with minimal leakage when it is worn. Most individuals who use CPAP are able to tolerate and benefit from it after a few weeks of regular use. Some people may need to address minor nuisance issues. If difficulties arise, it is important to be in contact with the equipment provider and your sleep specialist. If an alternative therapy is selected, you should be sure to evaluate the effectiveness of the treatment by having repeat sleep testing. It is important to resolve snoring and sleep apnea, as well as to demonstrate normal oxygen levels and sleep stability, to optimize the long-term benefits to your well-being and health. With treatment, many of the chronic conditions associated with sleep apnea can be resolved. It has been shown to improve daytime sleepiness, concentration and memory, heart disease and heart failure, heartburn and reflux, diabetes control, erectile dysfunction, depression, and reduce the risk of car accidents. If left untreated, sleep apnea can increase the risk of sudden death. Fortunately, many people can find an effective and acceptable treatment for sleep apnea. Start by speaking with your sleep specialist about the best treatment options for you. If you struggle, make sure to reach out to get the help that you need. Collop MD, Nancy. "The Effect of Obstructive Sleep Apnea on Chronic Medical Disorders." Cleveland Clinic Journal of Medicine. 2007 74:1. Epstein, LJ et al. "Clinical Guideline for the Evaluation, Management, and Long-Term Care of Obstructive Sleep Apnea in Adults." J Clin Sleep Med. 2009; 5:263. Kryger, MH et al. Principles and Practice of Sleep Medicine, 6th Edition. Elsevier. 2016.